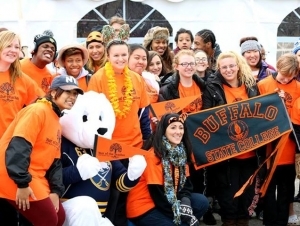 Members of Buffalo State's Best Buddies chapter and the Student Council for Exceptional Children braved the icy waters of Lake Erie on December 7 to participate in the Western New York Polar Plunge at Woodlawn Beach State Park in Hamburg. The annual event raises money and awareness for Special Olympics New York. Best Buddies is an international non-profit organization that creates opportunities for one-to-one friendships, integrated employment, and leadership development for people with intellectual and development disabilities. 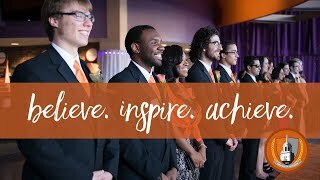 The Buffalo State chapter operates under the leadership of a student-run executive board. Chapter founder Lynne Sommerstein, lecturer of exceptional education, and and Krista Vince Garland, assistant professor of exceptional education, serve as advisers.